An Unyon Europea (ha literal nga Winaray: Pagkausa nga Europahanon; Iningles: European Union) amo an usa ka unyon pan-ekonomiya ngan pan-politikal han karuhaan kag-pito (28) ka mga bumulig nga estado nga nakabutang ha Europa. Mahitungod nga gusto magkamayda hin pagurusa nga rehiyon, an Unyon Europeo gintukod tikang ha Tratado han Maastricht han 1 Nobyembre 1993 tikang ha pundasyon han aada na nga Comunidad panekonomiya han Europa. Mayda haros 500 ribo o milyones nga munopyo an Unyon ngan ha pagtarampo, mayda ini 30% nga bahin (US$18.4 trilyon ha 2008) han nominal gross world product. ↑ "Eurostat-Tables,Graphs and Maps Interface（TGM）table". European Commission. Ginkuhà January 6, 2015. Bindi, Federiga, ed. The Foreign Policy of the European Union: Assessing Europe's Role in the World (Brookings Institution Press; 2010). The E.U. 's foreign-policy mechanisms and foreign relations, including with its neighbours. Bomberg, Elizabeth, Peterson, John, and Richard Corbett, eds. The European Union: How Does it Work? (3rd ed) (2012, Oxford University Press). ISBN 978-0-19-957080-5 and ISBN 0-19-957080-9. Corbett, Richard; Jacobs, Francis; Shackleton, Michael (2011). The European Parliament (8th ed.). London: John Harper Publishing. ISBN 978-0-9564508-5-2. http://www.johnharperpublishing.co.uk/pp007.shtml. Jordan, A.J. and Adelle, C. (eds) Environmental Policy in the European Union: Contexts, Actors and Policy Dynamics (3e). Earthscan: London and Sterling, VA.
McCormick, John (2007). The European Union: Politics and Policies. Westview Press. ISBN 978-0-8133-4202-3. Rifkin, Jeremy (2004). The European Dream: How Europe's Vision of the Future Is Quietly Eclipsing the American Dream. Jeremy P. Tarcher. ISBN 978-1-58542-345-3. Smith, Charles (2007). International Trade and Globalisation (3rd ed.). Stocksfield: Anforme. ISBN 1-905504-10-1. Piris, Jean-Claude (2010). Lisbon Treaty. Cambridge: Cambridge University Press. p. 448. ISBN 978-0-521-19792-2. Tupy, Marian L. (2008). 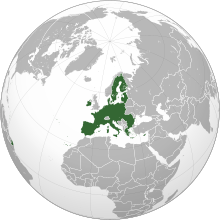 "European Union". In David R. Henderson (ed.). Concise Encyclopedia of Economics (2nd ed.). Indianapolis: Library of Economics and Liberty. ISBN 978-0-86597-665-8. OCLC 237794267. http://www.econlib.org/library/Enc/EuropeanUnion.html. Ini nga pakli kataposan nga ginliwat dida han 12:58, 2 Enero 2017.